Residents and anglers around several Eastern Washington lakes take great pride in boosting the trout fishing by tending net pens of trout to be released for anglers. The top net pen project in the region is at Lake Roosevelt, where the Bonneville Power Administration funds the raising of trout and kokanee to bolster fishing throughout much of the 150-mile long reservoir. All of the 750,000 net-pen-raised rainbows and 500,000 kokanee are adipose-fin-clipped before being released into the lake so they’re distinguished from native fish. 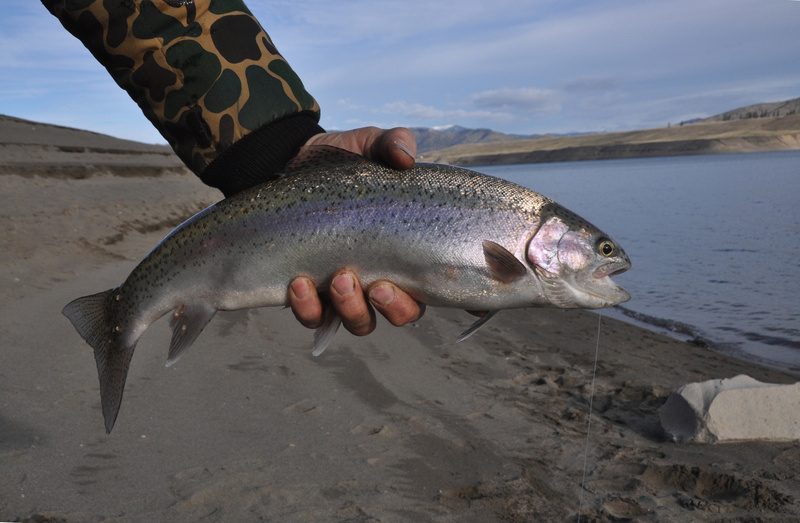 “Roosevelt’s rainbow fishery has been high quality, especially this past year,” said John Whalen, Washington Fish and Wildlife Department regional fish manager. “We had the benefit of good hydrology last year with a slow, controlled runoff, and we retained a lot of the fish to grow to large sizes. In other words: Get them now by boat or from shore while they’re here. The rainbows have been running a fat 16-22 inches long. “We time our net pen releases for summer when the water levels are starting to come back up so we can retain most of those fish in Roosevelt,” he said. Other net pen projects raising rainbow trout in the region include an excellent effort at Curlew plus Davis, Deer and Diamond lakes as well as Loon, where they’re raising tiger trout, and Waitts, where both rainbow and brown trout are released.